Musicians who play professionally should consider investing in a professional instrument. Joseph P. McDevitt, owner of Fegley Instruments & Bows, is a Philadelphia luthier who is passionate about his craft and can help you decide on an instrument that is absolutely right for you. We think you’ll be more inspired to play and practice if you absolutely love your instrument. Joe was trained in the art of making stringed instruments at the elite North Bennet Street School in Boston, and apprenticed with Marco Coppiardi, a master violin maker from Cremona, Italy, and Hans J. Nebel, a world-renowned violin restorer. His passion for his craft enables him to deliver the full musical potential from each and every instrument he makes. A “luthier” is a person who builds and repairs a variety of stringed musical instruments, such as violins, violas, cellos and guitars. The word comes from the French word luth, meaning lute. The art/craft requires a combination of mechanical drawing skills, woodworking skills, an understanding of the theory and application of varnish, and knowledge of how to play each instrument, as well as its set-up, basic maintenance and repair. If there is too much humidity, the wood of your instrument may swell, the pegs may stick, and seams may open when the glue absorbs too much moisture. Keep the relative humidity between 30 and 60 to keep the instrument safe. Dry conditions can cause the wood to shrink, sometimes unevenly, causing cracks on the face of the instrument. Excessive cold can cause shrinking and cracking of the varnish; shrinking of pegs and loosening of strings; or the glue may become brittle, causing seams to open. Excessive heat can cause the wood to swell, the varnish to soften and become sticky, and the glue to soften, opening up the seams. Never leave you precious instrument in the trunk of your car on a hot day. The wood of your instrument is generally thin, and its strength comes from its shape. Dropping the instrument may break the neck off. A slight blow can cause a soundpost crack on the top or back, especially if the soundpost is too tight. A blow can cause the glue to shatter, leading to open seams, cracks or changes in sound quality. Use a good quality case with adequate padding, and handle it gently. Always wash your hands before playing or handling your instrument. This will prevent fingerprints, oil and grime from building up on it. Use a soft cloth to wipe rosin off the stick of the bow and off your instrument after each practice. Common places where rosin accumulates are between the fingerboard and the bridge, on and under the fingerboard, under the bridge and on the strings. Never use commercial or household solvents to clean the instrument or you could damage the varnish. Necessary repairs should be done by a reputable Philadelphia luthier, such as Fegley Instruments & Bows. 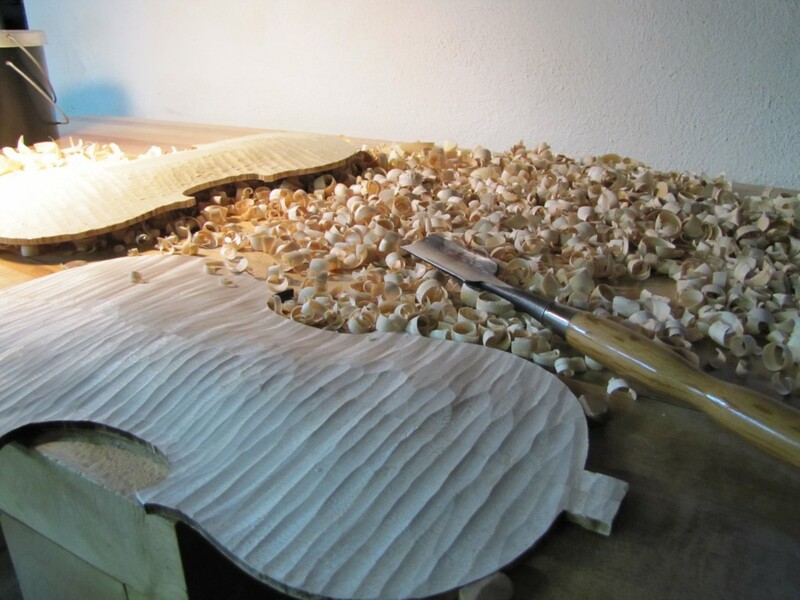 Developing an ongoing relationship with a highly skilled luthier will maintain your instrument’s health, and it will reward you with magnificent music for many years to come.